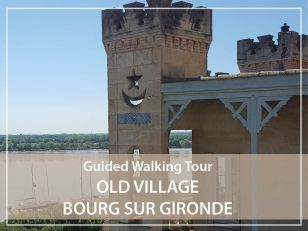 Visit Bourg-Sur-Gironde: an ancient village rich in anecdotes but no longer on the Gironde! But Bourg offers above all a multitude of anecdotes that are opportunity to revisit the French History through the setting of a typical village of our countryside... From the port to the upper town on the cliff, from the Roman Empire to WW II and the Fronde revolts, let me take you to the discovery of Bourg sur Gironde, a charming village on the banks of the Dordogne River. let's walk along the ramparts... Through our guided tour, discover the surprising history of the shipyards of Bourg or the explosion of an oil depot during the Liberation... Come to meet François Daleau, a prehistoric emeritus or Leo Lagrange, famous politician native of the village or Louis XIV, still too young to carry this title when he stayed here in Bourg sur Gironde. It is indeed a two-level city. The noble upper town, sheltered behind its ramparts, develops on its rocky promontory. We will find beautiful 18th century buildings. At the bottom, it is the port and merchant part. The port of Bourg sur Gironde was very active in the past: manufacture of bottles, wine exportation business, stones from Bourg area, fishing and shipyards shared the space. It houses an old wash-house dating from 1828 which is certainly one of the most beautiful in the region.